Cycling can be a great way to get around. 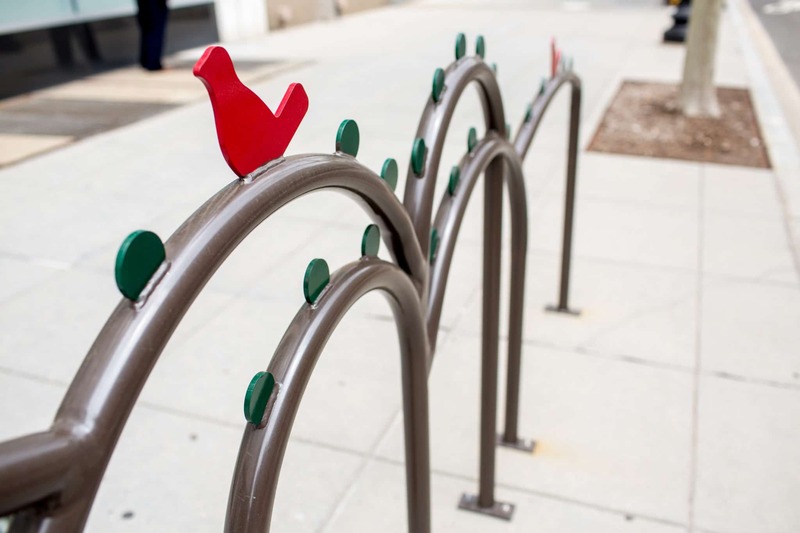 To help make DC’s central business district a more bike-friendly neighborhood, the Golden Triangle BID has installed six artistic bike racks, which meet the demands of parking in a fun and creative way. Bike Here: The Name Says It All. 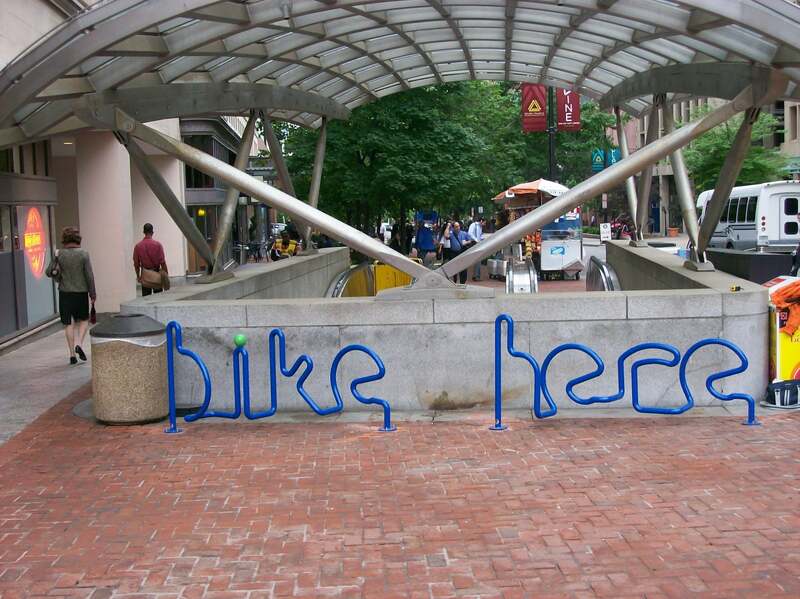 The first artistic bike rack, “Bike Here”, was unveiled by the Golden Triangle BID in May 2009. Spanning 13 feet, “Bike Here” holds ten bikes and adds a splash of color and vitality to the Dupont Circle Metro station’s south entrance. Clip Art: A Playful Take on a Standard Office Supply. The “Clip Art” bike rack at 2000 L Street brings both art and function together. 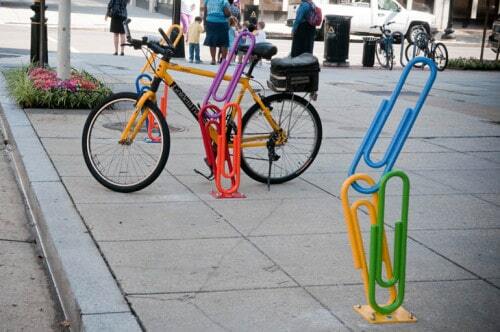 This creative bike rack accommodates six bikes and brightens up the business district with a playful take on a standard office supply. Both “Clip Art” and “Bike Here” designs were solicited through a call to artists and selected by a panel of representatives from the District government, the Golden Triangle community, and local artists and biking organizations. (Re) Cycle: Parking Without Having to Feed the Meter. 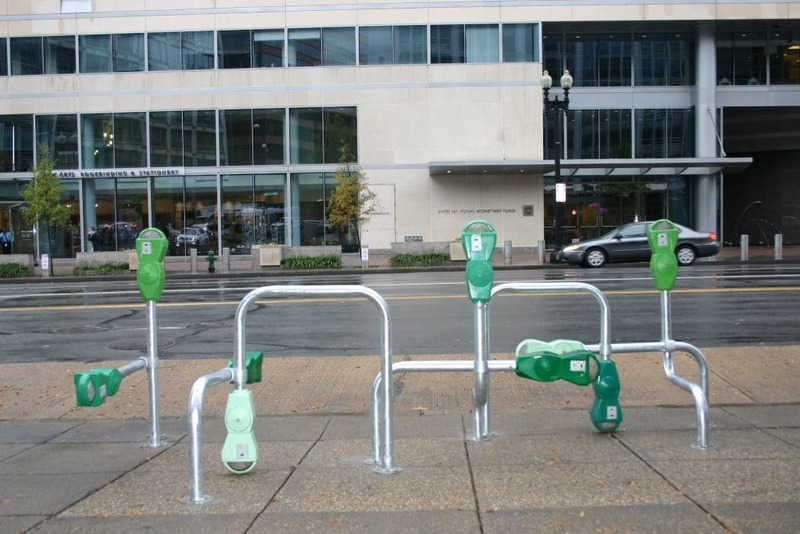 The bike rack “(Re) Cycle” at 1901 Pennsylvania Avenue provides parking for up to 10 bikes. The functional sculpture is made out of used parking meter heads that were provided by the DC Department of Transportation. “(Re) Cycle” was designed by local design firm, Design Army. 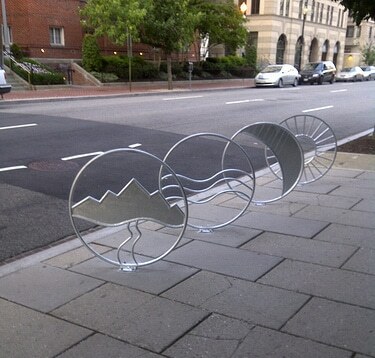 “Exploration” at 1600 M Street is a bike rack designed by two National Geographic employees who were inspired by the idea of exploring nature and discovering the world around you. It features mountains, water, the moon, and sun. Duck, Duck, Bike! Make Way for Ducks. “Duck, Duck, Bike!” at 1776 G Street was inspired by the mama duck and her ducklings that nest in the National Geographic courtyard each spring. The rack was designed by Design Army and named through a Facebook naming contest. Pedal Perch: Park Under the Willow Tree. 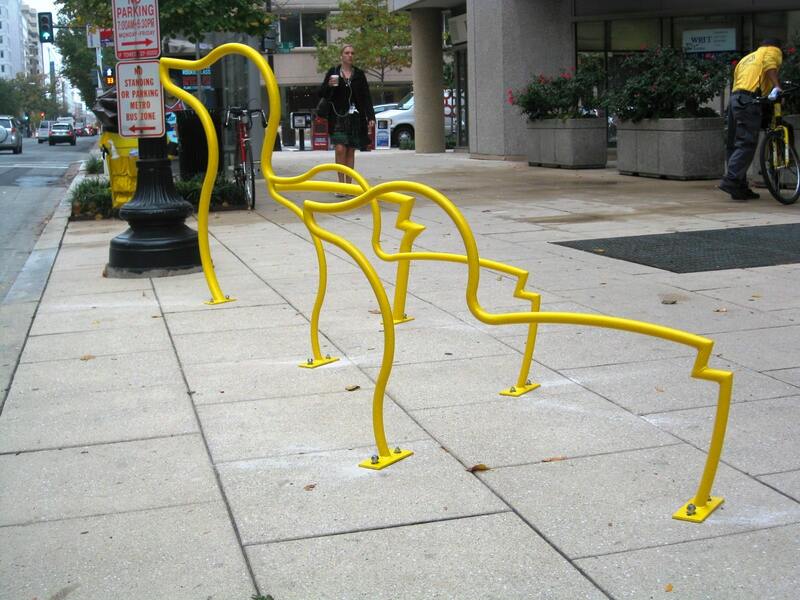 The latest addition to the artist commissioned bike racks was “Pedal Perch” at 2055 L Street. The “natural beauty of this bustling neighborhood, and the landscaping that makes this area so warm and inviting” inspired the design, as stated by the artist Kaylyn Bancroft. The bike rack looks like a willow tree and is a series of overlapping arches topped with sculpted birds and leaves.